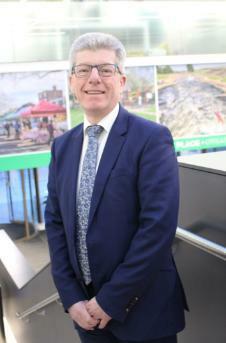 Rushcliffe Borough Council’s Chief Executive Allen Graham is to stand down at the authority after nearly 13 years in the role. The Council passed a recommendation at a Full Council meeting accepting Mr Graham’s resignation that will see him move on from the post on June 30 this year. Chief Executive Allen Graham is standing down after 13 years at the helm of Rushcliffe Borough Council Appointed in October 2006, he said his decision was taken as he felt it was the appropriate time for the Council to assess new executive leadership from a position of strength with Deputy Chief Executive Kath Marriott appointed Interim Chief Executive when the position becomes vacant later this year. Mr Graham said he was proud to lead the development of a modern and high performing Council which has been nationally recognised on five separate occasions and cited the authority being financially self-sufficient with an exciting and challenging agenda moving forwards. He said: “It has been a difficult and emotional decision to leave such a fantastic and wonderful workplace, community and council. “After 13 years you get attached to the place, the people and the work you do, especially in Rushcliffe where there is an ambition, energy and a determination to deliver high quality services, value for money and an exciting future. Leader of the Council Cllr Simon Robinson said Mr Graham leaves a legacy that has given the authority an exceptional local, regional and national reputation. He said: “Over the last two years I have been proud to work with Allen which has seen us transform the Council into one of the most progressive and modern in the East Midlands, whilst also being nationally recognised. “I know from my own business experience that to achieve brilliant things you require brilliant and transformational leadership and that is undoubtedly the footprint Allen will leave in our legacy when he leaves later this year. “We are delighted to announce that Kath Marriott will become Interim Chief Executive providing an opportunity for her to grow whilst maintaining stability through proactive succession planning. Mr Graham will still act as a Returning Officer to oversee the local Borough, town and parish elections in May.